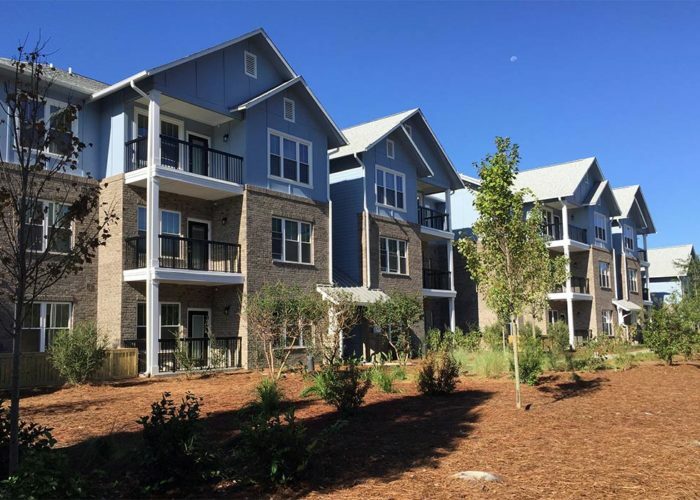 Oakside Apartments provides quality housing to 38 families in Johns Island, South Carolina. With its brick veneer and fiber cement siding, this up-to-date property meets Energy Star 3.0 standards. The two newly constructed three-story buildings feature 4 one-bedroom, 24 two-bedroom, and 10 three-bedroom units. Every apartment features many amenities including a porch, ceiling fans in the living and bedrooms, washer and dryer connections, dishwasher, microwave, range with hood, refrigerator with icemaker and 15 SEER HVAC unit for cooling and heating. Wiring for internet, cable and telephone is included in every unit. Residents have access to a fitness center, computer and laundry center as well as meeting space. Adjacent to the community room is the leasing office.